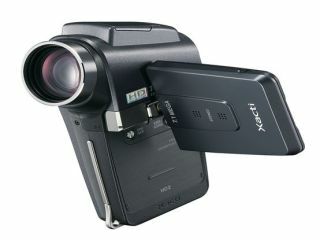 Word on the street has it that Sanyo is about to release something very exciting in its camcorder range (shh...) but until then we'll have to make do with the latest addition to the company's Xacti range of high-definition camcorders. The Xacti DMX-HD800 joins a bloated line-up that includes high-end models, entry-level machines and even Xactis that work underwater. The newcomer is a slim, pistol-grip model that weighs just 195g and shoots 30fps 720p video for the princely sum of ¥50,000 (£235). Naturally, there are varying video modes available, right down to 320 x 240-pixel footage suitable for uploading to a website. Compared to previous Xactis, the 8-megapixel still shots are a welcome improvement, while the ability to grab both video and snaps at the same time remains a draw. The other new functions are of more dubious appeal, but the '3-dimension Noise Reduction' (3DDNR) filter sounds like a nice idea, especially if it really does reduce picture noise. Lastly on the technical front, like other imaging firms, Sanyo has added a face-recognition algorithm, which it calls 'Face Chaser', for focusing first on any human mugs in frame. The HD800 will be available in three colours – gold, black and pink – when it hits the shops of Japan on 22 August. An overseas launch is sure to follow by year's end.